If you’re looking for a lovely Sunday afternoon meal for the Fall, salve these meatballs are for you. They simmer lazily in Parmesan Shitake broth while you read a book or take a nap. They’re great with a crusty piece of bread, on top of pasta or straight out of the pot if no one’s looking. Adding ricotta to your meatballs will take them to a whole new level, making them soft and tender and almost creamy. They’re delicate and hearty at the same time. A quick sear and they go straight into a broth flavored with Parmesan rinds and sauteed Shitake mushrooms. The meatballs cook through in the broth, infusing it with meaty goodness. Cooking meatballs in broth may seem weird (where’s the marinara? ), but they’re so flavorful that it would be a shame to cover them with sauce. I served these with homemade gnocchi for an excellent Sunday Supper. You can substitute ground beef or pork for the veal and lamb, just don’t leave out the ricotta. You can also make the meatballs ahead of time and they’ll keep (covered) in the fridge for up to 24 hours. Set a large pot over medium heat and add the chicken stock and Parmesan rinds. Cover and let simmer. Set a large skillet over medium heat. Once it’s hot, add the butter and the Shitake mushrooms. Sautee until the mushrooms are cooked but still tender, about 3 – 4 minutes. Add the Shitakes to the broth, reduce the heat to low or medium-low and set the skillet aside (you’ll use it again later). While the broth simmers, make your meatballs. In a large bowl, combine the veal, lamb, ricotta, breadcrumbs, salt, pepper, cream, milk, parsley and garlic. Using your hands or a spoon (I like to use my hands), mix everything together without compacting the meat. You want to keep your meat fluffed up for more tender meatballs. Once everything is combined, place a large piece of parchment next to your workspace and pile the flour onto a plate or Silpat mat. Now roll the meatballs together in the palm of your hand. Then roll them in the flour. 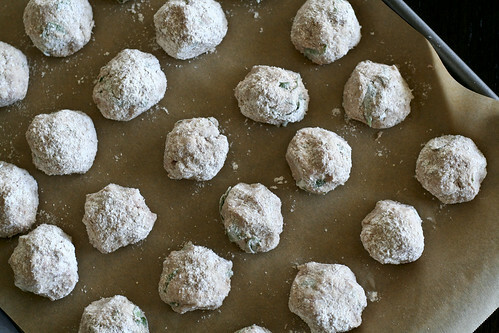 Place your meatballs on the parchment paper as you go. When your meatballs are made, (wash your hands!) set them aside and reheat your skillet over medium heat. Once it’s hot add 1.5 tbsp. canola oil, then gently lay the meatballs in the skillet, making sure the pan isn’t over-crowded. You want to work in batches here to make sure your meatballs brown evenly. Turn them only a couple of times, and only when the side on the heat has a nice brown char. Add the remainder of the oil for your second batch. When they’re browned on all sides, place them in the broth. Let the broth and meatballs simmer for 30 minutes to an hour. Serve on top of pasta, making sure to ladle on the broth, or simply in a bowl with some crusty bread and a freshly grated Parmesan cheese. I love the flavors in these meatballs- adding ricotta is a perfect idea. That gnocchi post is great… I’ve always wanted to make homemade! 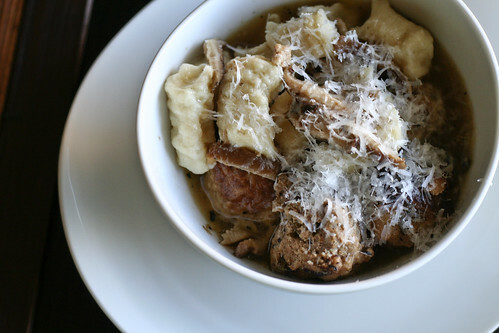 I adore having meatballs – especially ’cause they are so perfect as left overs. These sound terrific and I’m a huge lover of the lamb. I love this! I work for a company that produces lamb and veal, but we don’t have recipes with the two together! Yum! We do have plenty of recipes for each though, if anyone is interested in visiting http://www.superiorfarms.com. suzy – You can freeze them when they’re raw, then let them defrost in the fridge the day before you want them. You can also sear them, then freeze them and finish cooking them in Marinara sauce or broth when you’re ready to eat them. No need to thaw with this second option – just throw them in the cooking liquid. I haven’t tried using parmesan rind yet – I read somewhere you need to cut the outermost edge off before adding it to a dish – did you do that? Don’t want to skip a step and end up with something tough to put folks off from the finished product. It isn’t very cool here in Tx at the moment but as soon as the temps drop below the 90s again I will be trying this out for sure. I realize this is an older post, but I had a quick question- what do you think about substituting porcini mushrooms for shitake? Or is there something in particular you like about the shitake? Kate – Sounds great! If they’re dried, I’d rehydrate them before sauteing with butter. The parm cheese rind- Do I chop it up? Do I keep it whole? Do I actually eat it or just using it for flavor? Thanks! This recipe looks amazing! Christine – Just keep it whole and remove it later. It’s only there to season the broth.